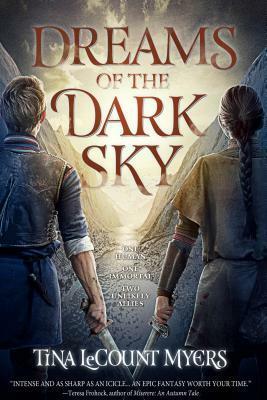 Inspired by Scandinavian indigenous cultures, DREAMS OF THE DARK SKY takes place during the aftermath of a devastating clash between gods and men, where two unlikely allies—one immortal and one human—must band together to survive. Writing the series led Tina on an incredible journey to reconnect with her Finnish family and the land of her mother’s birth. Inspired by her family’s homeland, Tina set The Song of All and DREAMS OF THE DARK SKY in the forbidding fringes of the tundra, where years are marked by seasons of snow, and humans war with immortals in the name of their shared gods. In the aftermath of a devastating clash between gods and men, two unlikely allies?one immortal and one human?must band together to survive in the sequel to the epic fantasy debut The Song of All. Raised by Irjan among the immortals, Dárja has been trained to fight by a man who once hunted her kind. Prisoner among the humans, her hatred for them is challenged by the chance to give Irjan what he has always wanted?his son Marnej returned to him. Dreams of the Dark Sky is the second book of the Legacy of the Heavens. The first, The Song of All, introduced readers to the worlds of the Jápmemeahttun and the Olmmoš. First among those created by the gods, the Jápmemeahttun lived in harmony on the fringes of the tundra until their numbers grew so large that they overwhelmed their lands. As they struggled to survive, the gods took pity and gave them a gift. The Jápmemeahttun would live their lives in two halves: the first as female and the second as male, and as one soul prepared to leave the world, another prepared to give birth. The life force of the gods would pass through the old soul into the unborn, giving the baby life and turning the mother’s gender to male in the process. In this way, balance was soon restored to their population. When the Olmmoš humans walked out of the east with their odd ways and their strange animals, the Jápmemeahttun welcomed them and taught them how to live upon the ice and snow and find light in the endless darkness. But over time, the humans grew wary of their guardians, whose lives seemed to stretch on forever. What started as an affinity between two peoples ended in enmity as the humans rebelled against the authority of those they called the Immortals. For generations, battles between humans and Immortals raged on, until the Immortal Elders discovered the Song of All. Believed to be a gift from the gods, the Song of All acted as a veil to shield the Immortals from human eyes so the two tribes could live in the same world and never interact. This fragile peace held for almost a hundred seasons of snow, until the Brethren of Hunters began to seek out the reclusive Immortals to regain their wartime power, now challenged by the priestly Order of Believers. Raised by the Brethren, Irjan had avenged his family, slain by rogue Immortals, by becoming the most skilled among the Hunters. He eventually grew weary of bloodshed, though, and fled to live a peaceful life as a farmer, husband, and father. But when he came upon his wife and infant son moments before they died, Irjan suspected the Brethren. Even as he mourned his wife’s death, Irjan tracked the Immortals deep into the snow-covered forest in the hope that their legendary powers would bring his infant son, Marnej, back to life. The Jápmemeahttun life bringers Aillun and Djorn had journeyed together to their Origin to give birth. The inherent danger in this sacred ritual was compounded when they heard a human voice within the Song of All. As Aillun started to give birth and Djorn, the ancient warrior, began to die, Irjan ambushed them. Thrusting his infant son into the light emanating from the old Immortal’s body, Irjan brought Marnej back from the dead. But Aillun’s subsequent death left Irjan responsible for Dárja, the infant Immortal she had birthed. Kalek, an Immortal healer who had been heart-pledged to Aillun. Together, Irjan and Kalek protected the infant Dárja, but could not prevent the Brethren from kidnapping Marnej. Kalek soon learned that Aillun had made Irjan Dárja’s guardian. Torn between his duty to his people and his lost love, Kalek brought Irjan to the Immortal Elders and what he thought was safety. The Elders knew what Irjan had not yet accepted—the human Hunter, in fact, had dual heritage, and possessed the unique ability to enter the Song of All as if he were a Jápmemeahttun. But his arrival among them bound the Elders to choose between protecting their kind from the humans and respecting Irjan’s right to live as one who had both human and Immortal blood. Their compromise to imprison Irjan temporarily staved off discontent. While imprisoned, Irjan consoled himself with his friendship with Kalek and his responsibility for Dárja. However, he continued to harbor plans to rescue Marnej from the Brethren, who would turn his son into a killer. Irjan escaped at the first opportunity, forcing Kalek to choose between his new friendship and his tribe. Convinced by Irjan that his son’s freedom would serve the Immortals, Kalek fought alongside his friend until he was wounded. When it became clear there was no hope of rescuing his son, Irjan chose to save Kalek’s life, returning with him to the Northland, where he and Dárja were reunited. Irjan spent the next sixteen seasons of snow as a prisoner, teaching Dárja what he knew best—how to fight. Dávgon, the Brethren leader, aware of Marnej’s Immortal blood and the unique abilities he possessed because of it, used Irjan’s now-grown son to track the Immortals and foment war between the two tribes. When Marnej entered the Song of All, the Immortal Elders realized there was no hope for peace. Dárja, who had grown into a skilled fighter, ardently supported the call to war. However, the revelation that she would never experience a fully Immortal life because of Irjan’s interference in her birth confirmed her fear that Irjan had always loved his son, Marnej, more than her. Determined to prove herself a true Immortal warrior, Dárja secretly joined the warrior ranks to confront the humans, unaware that Irjan had also joined as a last attempt at redemption. When the Immortal warriors used the Song of All to attack the human soldiers in the Great Valley, Marnej pushed his way into the mêlée, anxious to demonstrate his loyalty to the Brethren. While Dárja fought her way through the human ranks, Irjan gave his life to protect his Immortal comrades when the tide turned against them. Decimated by the human victory in the Great Valley, the remaining Immortal warriors withdrew into the Song of All while Dárja was taken prisoner. At the Brethren’s fortress, Dárja and Marnej confronted their shared past and discovered, to their surprise, the potential of their tenuous future. Kalek picked at the meager meal of stewed rabbit and bitter greens. He ate out of habit, out of a healer’s instinct to sustain his body, but, more and more, he wondered why he bothered. A suppressed giggle broke through the hushed atmosphere in the dining hall. Kalek looked up from his bowl. Two young nieddaš sat with their heads together. One had a hand over her mouth. Her shoulders shook with laughter. The boaris scattered about the dining hall continued to eat. The old showed no interest in the lives of the young. Once a lively center for sharing meals, the dining hall had become cheerless in the moon cycle since the battle with the Olmmoš. It was impossible to enter a common area and not think of those who had died defending their kind in the last battle. The Jápmemeahttun had believed the power of the Song of All would preserve peace by keeping them safely hidden. But the Olmmoš could not live in peace, and Kalek cursed the day they had walked out of the eastern dawn. He had not been born yet, but he knew the songs from before, when their kind had thrived in balance with the world around them. Look at us now, he thought. The few Taistelijan warriors who had survived the battle stood out among the nieddaš and the boaris. They were thankful to be alive, but they lived with the heavy burden of guilt. Indeed, it seemed that those who sought out healers, like himself, suffered less from an illness of the body and more from a sickness of the spirit. Increasingly, the old spent more time alone, listening to the Song of All, waiting for their time to end. They seemed to prefer the chorus of the wider world to the melancholy of their own immediate one. Yet, when called upon, they honored their duty as life bringers. They traveled to their Origins without complaint. Old and wise, they must have known that when their spirits left this world, new souls would likely not replace them. But what alarmed Kalek most was not the pervasive sadness among the old, but the changes wrought among the young. Although the youngest still ran about playing innocent games, the older ones left childhood behind for hard work. Wood for fires still needed to be chopped. Metal and leather still needed to be wrought. Animals still needed to be butchered. And fields still needed to be plowed. The survival of their kind depended on these tasks, which meant survival depended on the nieddaš, who were now the majority. The necessary new duties had made many of the older and more capable nieddaš sullen and silent. They exhibited a harshness that had not existed before the battle. Still, when the time came for these nieddaš to return to their Origins and give birth, they struggled, restless and fearful, because what had once been a rite of passage had become, to their minds, a death sentence. No one wanted to speak about what was happening, but none could ignore the fact that few nieddaš returned from birthing. Once, a nieddaš could expect to be a guide mother in the course of her life. Now she could only hope to be one. Kalek had seen the sidelong glances of those who still had no babe to love and nurture. And they all felt the palpable desperation as the songs of the guide mothers were sung less and less. Despite his calling as a healer, Kalek found it hard to offer counsel to those nieddaš who came to see him. In their sad faces, he saw Aillun, his beloved first heart-pledge, who had traveled to her Origin what felt like a lifetime ago. Believing she could save them both from sorrow, Aillun had not shared the truth of the quickening within her. At the time, Kalek had told himself his wounded heart justified his harsh last words. But really it was his injured pride that had made him growl like a trapped bear. Later, though, when Aillun failed to return from her Origin, he would learn what real heartache was. He would not be the one to send these innocent nieddaš to their death in the Outside. Startled by the voice, Kalek looked up. “Lighten your heart and be done with your meal,” Okta said. Kalek dropped the wooden spoon. He looked deep into the eyes of his mentor. A milky whiteness grew in them now, but the ancient healer’s gaze was still sharp and penetrating. He could not lie to his mentor, his friend. “What are we doing?” he asked, hopelessness flooding his question. Okta patted his apprentice’s hand. This was by now an old conversation between them. “It has always been so,” Okta said gently. Kalek’s head shot up. His pale, feverish eyes bore into Okta just as they had the day of the battle, when Kalek had found Irjan’s body. Nothing in the young healer’s training had prepared him to see his friend and lover broken and bloodied. It did not matter that Irjan was part Olmmoš and had once hunted their kind. He had fought and died like a true Jápmemeahttun warrior. Then, as now, Okta knew that Kalek’s giant frame could bear much, but anguish threatened to crush his soul. Okta nodded his head, allowing the reproach to stand. The old healer lifted his cup. He wished he could ease his apprentice’s pain. He wanted Kalek to regain his spirit, to see beyond the death of friends and comrades, and the death of those he had loved. Aillun first. Then Irjan. Okta drained his tea, then placed the cup down. The ancient healer did not wait for his apprentice to answer, and Kalek did not try to stop him. The knock upon the apothecary door stopped Okta at the garden’s threshold. He considered ignoring it, longing to be outside where the rhythm of life pulsed, unchanged and welcoming. But a healer could not ignore someone in need. He backtracked through the crowded room filled with pungent herbs and distilling tinctures. He opened the door, surprised to see the Noaidi. The formality of the Elder’s request placed Okta on guard. While the two shared a friendship that spanned ages, Einár was the head of the Council of Elders and the gods’ Oracle. For the last several seasons of snow they had not agreed on much, but in the vast span of their lifetimes, this was but a small matter. “I have not seen much of you since our return,” Okta said, standing back to allow the Elder’s hunched frame to enter the apothecary. When did Einár become so thin? So frail? he wondered. Okta winced. The name cut him like a knife. His hand rose to his chest where the weight of responsibility rested heavy and immutable. He was to blame for what had come to pass, at least in part. He had been angry and callous when he had last spoken to Dárja. He had told her she would always be a nieddaš. That she would never be a mother. Never be an almai. Never be a warrior. He had been blunt and brutal, and he had immediately regretted it. Despite all his training as a healer, Okta had not understood what it meant to live a singular life. His had been a Jápmemeahttun life. He had been a nieddaš. He had given birth. He had handed his child to her guide mother, then embraced his life as an almai. When asked, he had become a warrior. He had experienced it all, as his kind was meant to. But Dárja was unique, and Okta had failed her. They had all failed her. “I have heard her song,” Einár said. The calm pronouncement set Okta back on his heels. He braced himself on the edge of his scarred work table. Disbelief clouded his thoughts, but his heart pounded. Dárja had disappeared the day the Taistelijan had marched to battle. He did not doubt she had wanted to prove herself worthy to be a warrior. To prove him wrong. And he was wrong. He was wrong to keep his doubts about her future to himself for as long as he had. He could have helped her. They all could have helped her. But the truth remained hidden for too long, too painful to relive. Okta’s elation made him eager to tell Kalek. The news would give the young almai the encouragement he needed. It would light the way back from the darkness that had consumed him. Whatever hope had welled within in the ancient healer was dashed. “Marnej,” he muttered, remembering Irjan’s son, whose very existence had threatened what little peace remained to their kind. Silently, he blamed the boy, So much life lost. So many lives changed. And Marnej at the root of it all. Okta staggered back at the impact of this judgment. He glanced at Einár, expecting to see condemnation. Deep folds shaded the Elder’s weary eyes. Okta’s shame bloomed hot. He had just quietly denounced the Olmmoš boy when he should have castigated himself. Blame rested with him, not Irjan’s son. Okta plopped down on the bench beside his work table. He was too old and he had seen too much to deny his attempt at playing a god. When Irjan had entered their lives, Okta had been adamant that, as half-Jápmemeahttun, Irjan deserved to live. But there was a part of him that now wondered if their kind might have been spared the recent tragedies had he just let the Taistelijan warriors track and kill Irjan in the very beginning. The Elder withdrew from the apothecary, closing the door behind him. Okta sat, taking stock of the news. The knowledge that Dárja lived was both a profound joy and a subtle agony. Selfishly, he wanted to see her determined young face peer around his door again, if only to exonerate him for his part in her misery. But if that came to pass, he would once again have to cause her heartbreak. He would have to tell her of Irjan’s death on the battlefield. Young. Headstrong. She will only see her part in it, Okta thought woefully. He could not say Dárja had been wrong to blame Irjan for what had happened. Irjan’s actions had altered the course of all their lives. In trying to bring his son, Marnej, back from the gods’ embrace, Irjan had doomed the life bringers, Aillun and Djorn. The life force created by a boaris at death was meant to help the nieddaš give birth to her child and then allow her to transform to almai. Djorn did not have the power to sustain life for more than two souls. Marnej had been reborn, but Aillun died. And Dárja had been denied the life force she needed to mature fully as one of their kind. When Irjan had pleaded to join the warriors leaving to fight the Olmmoš, Okta had recognized a man desperate for some kind of redemption. While he did not agree with the need for bloodshed, he respected Irjan’s desire to be a part of it. He had not talked Irjan out of fighting. Rather, he had helped him, and embraced him, and watched him ride into battle. His heart had ached for the man. Half Jápmemeahttun and half Olmmoš, Irjan had labored to do what was right and had suffered for love. Kalek was right to agonize over how to tell Dárja this truth, he mused to himself. If she were to walk through his door right now . . . The thought disappeared almost as soon as it formed. Okta leaned forward to rest his hands on his knees. The anticipation kindled by Einár’s news flickered briefly before reason snuffed it out. Dárja may be alive, but she could easily be a prisoner or pursued by the Brethren of Hunters, by Marnej even. Okta was certain that, despite the distant connection between Dárja and Marnej, if their songs were heard together, then it could only mean she was in danger. Marnej had been raised as an Olmmoš. Raised to be a Piijkij, like his father, he had sworn an oath to kill their kind. Marnej might be Irjan’s son, but he was also a Hunter. Okta wanted to act. He wanted to do something. But Einár’s warning stung his conscience like summer nettles. In the past, Okta had sent Kalek out to meddle in the affairs of the Olmmoš, believing it to be the best course of action. And he knew if he told Kalek that Dárja’s song had been heard, his apprentice would rush into the Outside to try to find her. Kalek was as much a guide mother to the girl as Irjan, even if Irjan was her chosen biebmoeadni. Okta wrestled with his thoughts. The reasonable part of his mind said it would be futile to send Kalek out to save Dárja. She could be dead within days. But the truth was that he could not bear the thought of losing Kalek. He had risked his apprentice’s life twice, believing the chance for peace was justified. But never again. Kalek was too dear to him and the future was now too uncertain to risk anything on some notion of pride. Okta still sat with his hands upon his knees when Kalek entered the apothecary. If any misgivings persisted, they disappeared the instant he saw his apprentice. Framed by his pale, lank hair, the young almai’s doubt-etched brow overshadowed his face. If the gods possess pity they will place no more demands upon him, Okta thought, then silently promised, Nor will I. “I thought you had left to collect herbs,” Kalek said, surprised to see Okta. “Yes, yes. I became distracted and delayed,” the ancient healer said, staying within the bounds of truth. Okta watched Kalek’s sure, fluid movement around the apothecary. How different their paths had been. He remained grateful that Kalek had not had to fight in the war. Too young for the ancient battles and too valuable for this last stand, Kalek had been spared. But even as he praised the gods for this small mercy, he knew that the young almai had not really been spared. To watch one’s kind slowly die over a lifetime might prove to be a greater cruelty than witnessing comrades killed in battle. Kalek took the thin woolen cloak from its worn peg. He held it out to Okta, who stood. Kalek’s smile lingered, but it did not reach his eyes. Enter now by clicking this Rafflecopter link! Open to residents of the US only. This giveaway will run until April 8. Good luck! Oooh! This sounds like an awesome giveaway!! I’m entering! Good luck! The box really is amazing! I don’t think I’ve read a Finnish-inspired fantasy before, so this looks exciting! (though I’m guessing I need to read the first book) And I love that backstory! The book sounds interesting. And it is great that they are having a giveaway. 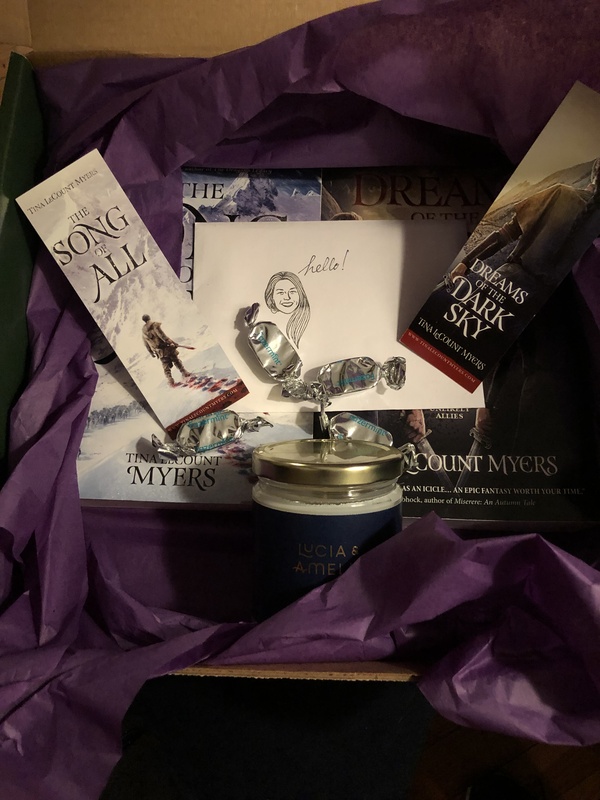 It really is a well put together box, Night Shade Books and Wunderkind really went above and beyond! That’s a rather lovely giveaway – good luck to all your entrants. Yes, some pretty swag there!